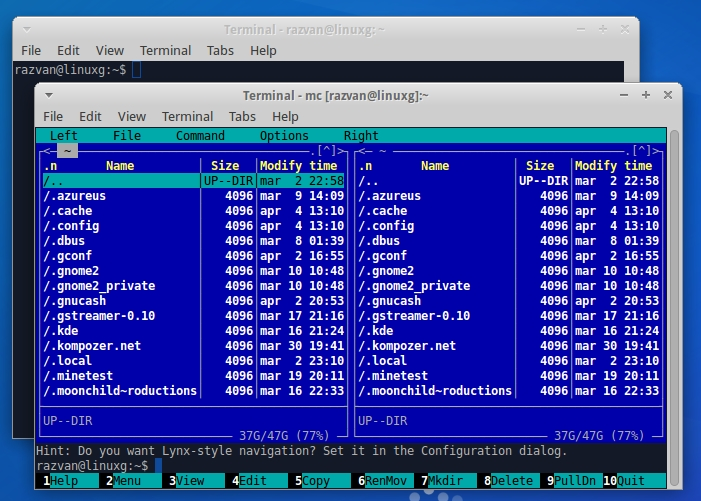 Midnight Commander, or MC, is a file manager released under the GNU license. Like every file manager, it enables the users to easily copy, move, delete and manage files and folders, having a full-screen text mode user interface. The latest version available is Midnight Commander 4.8.15, which has been recently released, coming with the below changes. The installation instructions should work on all the supported Ubuntu systems and derivatives: Ubuntu 15.10 Wily Werewolf, Ubuntu 15.04 Vivid Vervet, Ubuntu 14.04 Trusty Tahr, Linux Mint 17.3 Rosa, Linux Mint 17.2 Rafaela, Linux Mint 17.1 Rebecca, Linux Mint 17 Qiana, Pinguy OS 14.04, Elementary OS 0.3 Freya, Elementary OS 0.2 Luna, Deepin 2014, Peppermint 6, Peppermint 5, LXLE 14.04 and Linux Lite 2. As any other file managers, you can navigate inside it with the Up and Down arrow keys and open the highlighted files or folders by pressing Enter. Also, to switch to the other directory pane, press Tab. Inside the file manager, if you need to perform multiple selections, hold the Shift Key and press the Up and Down arrow keys, to select the desired files. To delete the highlighted file or folder press F8 and next answer “Yes” to confirm or “No” to cancel. To copy the highlighted files from one panel to another press F5, or if you need to move files from one panel to the other, use F6. To view a highlighted file, press F3 and use the Up and Down arrow keys to scroll, if the file is long. To exit from the file viewer, either press F3 again or Esc two times. To edit a file inside the built-in editor, press F4 after you have highlighted the file. To view files inside archives, highlight the archive, press Enter and navigate by using the Up and Down arrow keys. This permits to copy certain files to and from the archive. To run scripts, highlight the script and press Enter. To return to the FM, press Enter again. Also, inside the file manager, if you need to open the Menu, you can either click it with the mouse or press F9. Once the menu is opened, use the Right and Left arrow keys to switch between menus and the Up and Down arrow keys to select one of the items and press Enter to activate the selected menu item.